“Lonergan’s clean, sharp lines, minimal backgrounds, and pure black and white (no grays, not even via shading) make another story of a youthful, probably temporary relationship vivid and affecting. See more on Joe & Azat and Jesse Lonergan. So says Chris Mautner on Comic Book Resource’s Robot 6. “The art of Joe and Azat is deceptively simple. Black and white images, mostly of faces and places, do an adept job of telling the story. On the surface it represents the simple way of life for the people of Turkmenistan. However, when you study the images in adjunct with the text, the complexity of this style becomes apparent. Longerman utilizes juxtaposition to explore perception and reality. People would like things to go one way, but the reality is that they must go another. For example, the Peace Corps administrators would like for Joe to follow the rules given to him for navigating Turkmenistan, but the reality is that he would never survive if he did. Sequential Tart, giving it an 8 out of 10. And one of Canada’s main papers, the National Post, picked up the piece on this book that ran in the Wall Street Journal. 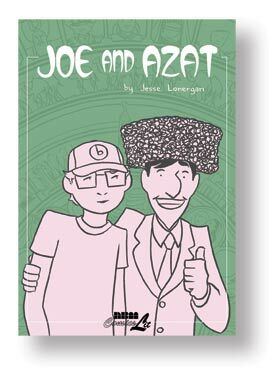 Boston’s Weekly Dig calls Joe & Azat by Jesse Lonergan “a damn cool book”, the reviewer admits to this being her first graphic novel and loving it. Cute.